Participants in the 14th annual Afrikan Black Coalition Conference pose for a group photo. Fifty years after Martin Luther King Jr.’s “I Have a Dream” speech and his assassination, racism seems eternally alive. Due to police brutality, mass incarceration and even the newly elected president Donald Trump, many are losing faith in society. But for many hopeful black students, they act differently by attending the 14th annual Afrikan Black Coalition (ABC) Conference. 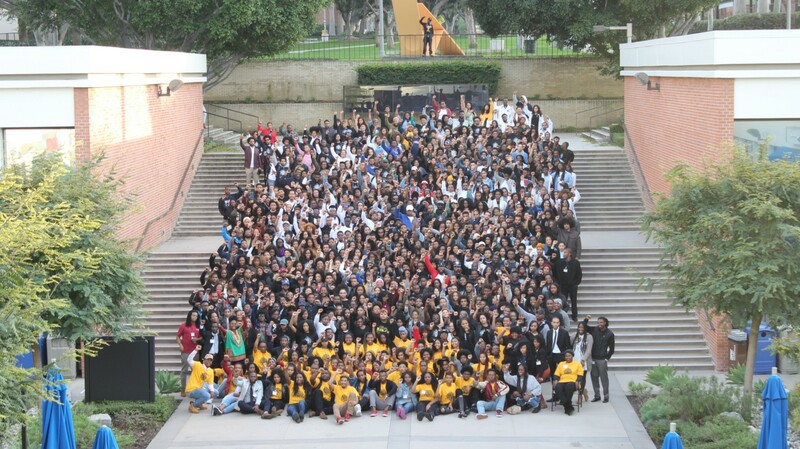 The ABC conference is usually hosted by Black Student Union (BSU) members from University of California schools to help black students and their communities. This year, however, Long Beach State’s BSU became the first California State University school to host the event on its campus. Actress and model Celisse Graves during a fashion show at the conference. The conference’s theme was “Reviving a Nation,” and aimed to connect with the more than 800 students in attendance. 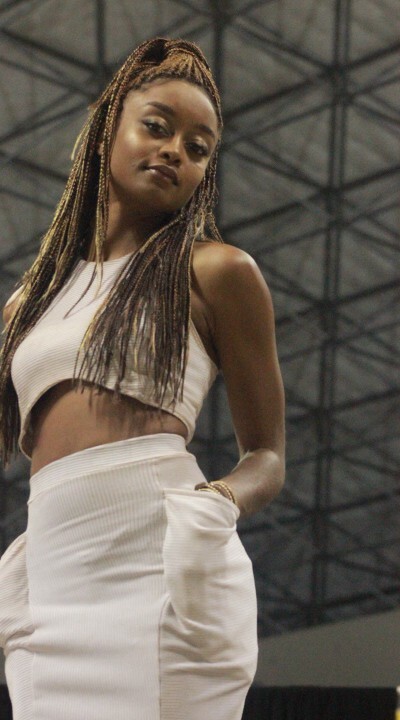 The event had a festive unity carnival, guest speakers, workshops, and a fashion show with an appearance by actress and model Celisse Graves. Performances at the conference featured singers, rappers, as well as dance group Le Ballet Dembaya. Justin Bradley, former CSULB BSU president and vice chair of the event, introduced Minister Louis Farrakhan, leader of the Nation of Islam to speak. Farrakhan spanned on many topics regarding freedom. He discussed issues regarding colorism, gender, religion, defending black women, his relationship with Malcolm X and Elijah Muhammad, as well as fighting under an African name. “How can you fight for Black Liberation and have no name connected to the mother continent?” Farrakhan asked the audience. Farrakhan said blacks should psychologically free themselves by gaining knowledge of their past, which received a mixed response, but many understood his intentions to move his people forward. One of the workshops conducted at the conference was led by UC Berkeley board member Yoel Yosief on Pan Africanism. His workshop titled, “Your Eyez Only,” covered how capitalism has stifled the continent of Africa through colonization within its countries and enslavement of blacks in the Americas. Yosief emphasized the importance of gaining land, wealth and black unity to live soulfully sublime. 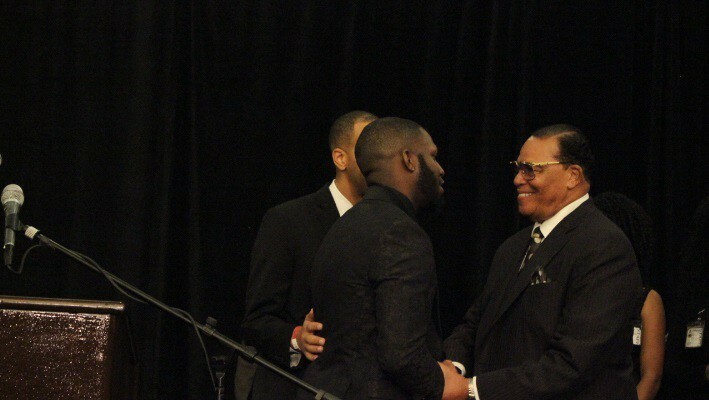 Justin Bradley shakes hands onstage with speaker and Nation of Islam leader Minister Louis Farrakhan. The conference began wrapping up with award-winning short documentary, “Bars4Justice,” directed by Queen Muhammad Ali and Hakeem Khaliq. The short film presented hip hop activists opposing police brutality after the fatal shooting of Michael Brown in Ferguson. The film resonated with audience members upset by those who walked away unpunished for their acts. Many wanted to honor those that were no longer alive by gaining knowledge and finding solutions. Information about the conferences or other events and opportunities organized by BSU is available by visiting csulbbsu.weebly.com/bsu.